December 4, 2015 | Practice News. In order to understand the difference between an implant and bridge, you must understand why you might need restoration. First, imagine your teeth. Suppose there is a missing tooth, creating space between two healthy teeth. In an effort to keep your beautiful smile and maintain proper oral health, you contact your oral care provider to see what options you have for treatment. Your dentist or oral surgeon will probably suggest 2 options: the bridge or an implant. Think about how a metal or concrete bridge connects two pieces of land separated by water. A dental bridge is similar. The dental bridge consists of two crowns (caps) and a connected false tooth in the center. By capping the two healthy teeth adjacent to the gap made by the missing tooth, and filling the space with a false tooth, a bridge is created. This procedure actually replaces the root of the missing tooth with a titanium screw. By setting the screw into the jaw bone, the implant is held secure and provides stabilization to the jaw bone helping to avoid bone loss. Once the screw has been set, an implant crown is secure over the top of the screw head resulting in a natural looking tooth. Picking a bridge over an implant is not really a decision you can make. Depending on your general and oral health, your oral care provider will determine what the best treatment option for you will be. Different preparation is required for each procedure. Although a bridge sounds quick and simple, the healthy teeth will still need to be prepared for the crown. If the teeth adjacent to the gap aren’t healthy, you may even need a root canal. 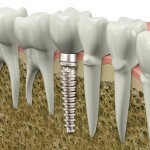 Implants require an extensive process requiring a team of dental professionals. Ranging from a periodontist, oral surgeon, a restorative dentist and a laboratory technician to create the implant, your procedure for implant restoration requires proper planning to complete the process. Consulting with your dentist or an oral surgeon can make a huge difference when deciding if you should have dental restoration. Dr. Davis is a leading Raleigh oral surgeon and can help provide you with information about the restoration process. Everyone wants to keep their teeth for function and cosmetic reasons. By contacting Davis Oral Surgery & Implant Center, you can meet with our doctors and decide if a dental restoration procedure is right for you. Call 919-488-2194 today or complete our online contact form for a consultation.